In the history of human civilization, the philosophers who can approximate the depth and range of Plato are few and far between. Philosophers and scholars all around the world have used Plato's distinctive method of approaching metaphysical, ethical and political issues. Platonists, those who have been deeply influenced by his "Theory of Forms", also called the "Eternal realm of Ideas", have been greatly assisted in their studies of the human nature. Plato's works have an unparalleled influence on the way politics, morality, psychology, religion and cosmology are viewed. The exact time of Plato's birth can not be confirmed, but it must have been around 427 B.C. Plato was born in Athens, and belonged to a high status, aristocratic family. His father Ariston, was believed to have descended from the royal family of Cordus, the king of Athens, and his mother, Perictione, was niece of Critias the leader of the Thirty Tyrants and a relation of Solon, the famous lawmaker. By the same parents, Plato had two older brothers, Glaucon and Adeimantus and one sister, Protone. When his father died, his mother married her uncle, Pyrilampes, and from this marriage Plato had a half-brother, Antiphon. 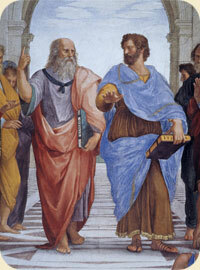 Plato & Aristotle, from the painting "The School of Athens" (Scuola di Atene) by Raphael (~1510). Plato's extended family was highly influential and politically active and he took great pride in mentioning his distinguished relatives in his dialogues, despite the fact that he was rather reluctant to make references to himself. By reading his dialogues, especially "Charmides", the reconstruction of his family tree can be easily performed. Plato's real name was Aristocles, after his grandfather, but his wrestling teacher gave him the nickname Plato, from the Greek word "Platos" meaning "width", because of his physique or the breadth of his forehead. Plato was highly influenced by Socrates, who he met at boyhood through Critias, his mother's cousin and Charmides, his mother's brother, who were both members of the Thirty Tyrants. That is probably the reason why Plato's early ambitions were to enter politics. He is also said to have started his writing career by writing a tragedy to enter in a drama competition. However, he was soon repelled by the unscrupulous practices prevalent in politics of his time, and abandoned the idea of writing tragedies when he heard Socrates talk. When Socrates was executed in 399 BC, Plato left Athens and took temporary refuge in Megara, a town close to Athens. During the following years, he travelled extensively in Greece and Egypt. He also visited Italy and Sicily but he was disgusted by the extremity of the sensual way of life there. However, he met Dion, a kindred spirit, who was brother-in-law of Dionysius I, the tyrant of Syracuse. About 387, Plato went back to Athens and founded the Academy, which was an institute for scientific as well as philosophical research. He remained the Head of the Academy for the rest of his life. Plato left his Academy twice, in 367 BC and 361 BC and went back to Sicily to help Dion and some other prominent men restore democracy in Sicily. However, Dion was murdered in 354 BC and then Plato drew up his most important Epistles vii and viii in which he justifies the policies Dion used and tries to make proposals for a conciliation of the Sicilian parties. Plato is believed to have died either while writing, or while attending a wedding feast in 348/347 BC and to have been buried in the Academy. 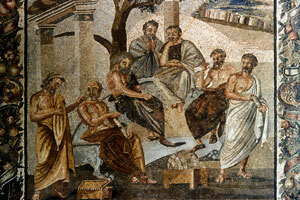 Plato used to teach his students on the estate of the legendary Athenian hero called Academos, hence the word "academy". To the world, Plato's contribution is that of his philosophical ideas but to Plato himself his chief work was the foundation and the development of the Academy. 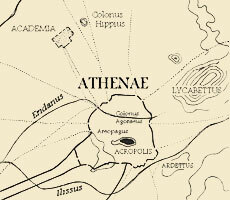 Students of mathematics and geometry cooperated to make the Academy the link between Euclid's geometry, the Pythagorean mathematics and the Alexandrian arithmetic. Science, natural history and botanical classification as well as political sciences like legislation and jurisprudence were parts of the studies in the Academy, which is considered the first establishment of a university both in humane and exact sciences. The Academy lasted for about one thousand years after Plato's death, until the 6th century A.D.
Read an except from the dialogue or watch an animated version of Plato's cave. An Allegory is an extended metaphor. An allegorical story consists of figurative elements which have an abstract or a spiritual meaning. With the exception of the Apology and the Epistles all of Plato's works take the form of a dialogue. Some of the dialogues and many of the epistles are a matter of controversy as to their authenticity. The Apology is believed to be Socrates's speech to defend himself when he was convicted of impiety. But the dialogue form is also present in the Apology, when Socrates poses philosophical questions to his accuser, Melitus, and responding to them. His 25 dialogues are philosophical discussions among a small number of interlocutors, the main one being Socrates. The dialogues begin by depicting the setting of the discussion which might be the participation in a social event or an ordinary activity. In these dialogues Plato not only criticizes the characters and way of life of the interlocutors, but also comments on the political and social status of his time, while he attempts to draw his readers into participating in these discussions. Such dialogues are Symposium, Gorgias, and Protagoras. Plato attempted to prove the rational relationship between the cosmos, the soul and the state. For example, in The Republic he tries to depict the ideal state through the operation of justice, but justice has first to be realized within each individual so that its implementation can be feasible in the state. However, justice can only be fully understood only if it is related to the Form or Idea of Good, the supreme idea of eternal truth. The Form of Good, is the source of reality of everything that exists and on which all other ideas and values depend. In the Symposium, the Good is considered to be the supreme Beauty and the means of seeking and attaining pure, "Platonic" love. 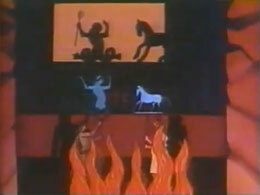 In The Republic, the path leading to the Form of Good is depicted through a metaphor of the cave and the way its chained inhabitants perceive the world around them. They progressively find a truer form of things and although they believe that they have reached the final form of truth, they realize that they are constantly deceived. Using this simple metaphor, Plato succeeds in making his readers realize that our world is a world of shadows and only when we come out of the cave, we will be able to escape the mirror world we live in. And in just another sentence of wisdom, Plato managed to give humanity the three ultimate qualities each human being should attempt to acquire: Moderation, Emotional Balance and Self-acquaintance. Plato's influence on Western thought, culture and philosophy can be traced from the ancient times up to the present day. As A.N Whitehead, an eminent 20th century metaphysician declared: " The safest general characterization of the European philosophical tradition is that it consists of a series of footnotes to Plato".